"The Adventure of the Red Circle" appears in the volume of Sherlock Holmes short stories entitled His Last Bow. 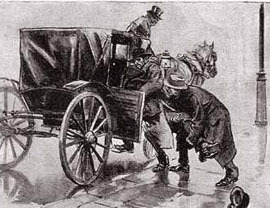 The case is believed to have come to the attention of Mr. Holmes in 1902 (William S. Baring-Gould), and the story was first published in serial form in the Strand Magazine in March and April 1911. The original title was "The Adventure of the Bloomsbury Lodger." Two men came up behind him, threw a coat over his head, and bundled him into a cab. Holmes was passing it backwards and forwards across the window-panes. In September 1949, Karen Kruse and Patricia Parkman, high-school students in Takoma Park, Maryland, wrote to the popular Washington Post columnist Bill Gold, seeking others who might be interested in forming a Washington scion of The Baker Street Irregulars. In November, Karen reported to Gold that she had heard from Dorothy Bissonette and Svend Petersen, and that the group would meet 'soon'. Karen initially thought that Vermissa Valley 341 would be a good name, but discovered that The Scowrers of San Francisco had beaten her to it, and fell back on her second choice. In January 1951, Edgar W. Smith reported in The Baker Street Journal that a group to be known as The Red Circle now existed in Washington. Later that year, the distinguished journalist Elmer Davis suggested that the name alone might spark an investigation by Senator Joseph McCarthy. At an organizational meeting, Karen was elected 'Match' (president), Pat became 'Wax Vesta' (vice president), Mrs. Bissonette 'Daily Gazette' (secretary), and Petersen 'Soap' (or sergeant at arms). The first annual dinner was held on November 16, 1951, with twenty five diners who included Edgar W. Smith, James Montgomery, and Elmer Davis, plus the original four. Other early members were Paul Scott Rankine of Reuters, Walter Trohan of the Chicago Tribune, Felix Morley and Paul Gore-Booth, then stationed at the British Embassy. And their wives, for The Red Circle has always been joyfully co-educational. The group met regularly throughout 1952 and 1953, and J. Edgar Hoover, the legendary director of the Federal Bureau of Investigation, was invited to but was unable to attend the 1952 annual dinner. Topics at that dinner ranged from the Venerable Bede to Lizzie Borden. By 1954 Karen Kruse was in California, and Paul Gore-Booth was the British ambassador to Burma. Reports of meetings no longer appeared in The Baker Street Journal. Karen reappeared in San Francisco in 1956 as Karen Kruse Anderson, married to science-fiction and Sherlockian writer Poul Anderson, and serving as 'Harraway' (corresponding secretary) of The Scowrers and Molly Maguires. In the mid-1960s, Paul Gore-Booth, by then head of the British Diplomatic Service, also became president of The Sherlock Holmes Society of London. For the next fifteen years The Red Circle lay dormant. Washington's male Sherlockians could worship with The Six Napoleons of Baltimore or The Sons of the Copper Beeches in Philadelphia, but women had to console themselves upon unrecorded occasions, as the famous Solitary Cyclist of Washington did. Then, in 1970, Peter E. Blau settled in the capital and revived The Red Circle. The first meeting was at Gusti's, an Italian restaurant, and the second honored the newly ennobled Lord Gore-Booth. The Red Circle was back in business, and regular meeting were held at Blackie's House of Beef, a many-roomed restaurant conveniently across the street from Peter's office. In 1974, Miles Kington's dual parody "The Case of the Danish Prince" appeared in Punch, and Jon L. Lellenberg urged the formation of The Red Circle Players to enact this gem; the cast included Wayne Swift as Holmes and Norman Davis as Watson. In October, there was a theater party to see the Royal Shakespeare Company's stylish production of William Gillette's Sherlock Holmes at the Kennedy Center, followed by a reception for the cast. Later that winter Wayne committed "The Case of the Scottish Horror", which dripped with even more hideous puns that Kington's effort. The success went to Wayne's head, and inspired by the popularity of another British import, he and Norm Davis started writing 'Upstairs, Downstairs, All Around the Holmes'. This gripping drama of the human condition was continued by Wayne after Norm moved to Chicago in the mid-1970s. Interest in drama continued. Theater parties have attended Cats, Sherlock's Last Case, the Firesign Theatre's version of The Giant Rat of Sumatra, and more recently Nick Olcott's delightful Sherlock Holmes and the Case of the Purloined Patience. The Red Circle has also exploited the collections of both the Library of Congress and the American Film Institute in a number of film evenings. The summer of 1977 saw the society's Cat House Picnic, a visit to Lion & Tiger Hill at the National Zoological Park, complete with a curator's lecture on the zoo's Atlas lions and white tigers. A costume party rocked the ball-room of the National Press Club in 1980, and reportedly caused a senior member of the club to swear off alcohol after he saw the Giant Rat stalk through the Members' Bar, looking for the controls of a cranky sound system. Nearly all meetings of the society feature a quiz, with questions based on a previously announced "adventure of the evening," and frequently involving convoluted puns. The first election of officers also was the last; Peter Blau serves as the society's sparking plug, but Karen Kruse Anderson remains its first and only 'Match'. The society has flourished during the 1980s and 1990s. During the ice-clad winter of 1994, Wayne and Francine Swift coordinated a six-session course on "The World of Sherlock Holmes" for the Smithsonian Institution's Campus on the Mall adult-education program. More than a hundred people registered, and fought truly appalling weather to make it the best-attended literature course the Smithsonian had yet offered. Also see Jon Lellenberg's account of some of the early lights of the Red Circle in his fine paper, "Giants in the Earth." Click here to read it.